Central Warehouse was built in 1927 as a â€œcold and dryâ€ storage facility in the days before retailers and distributors maintained such facilities on their own. The 400,000-square-foot behemoth once held enough frozen foods to feed the Capital District a few times over, but it's been largely vacant since at least 1990. The building has been controversial since the 1980s, when a businessman and philanthropist named Richard Gerrity owned it. The deeply religious Gerrity painted a huge â€œYear of the Bibleâ€ sign on the building in 1983. The redecoration drew the wrath of the state Department of Transportation, which argued that the sign's size made it a clear violation of the federal Highway Beautification Act. The DOT finally prevailed over Gerrity's C.W. Associates in an out-of-court agreement, and the sign was removed in 1987. C.W. Associates declared bankruptcy in 1995, and the building passed to Trustco Bank, which acquired the property at a foreclosure auction in 1996 before selling it to Frank Crisafulli, a retired owner of a food distribution company. Crisafulli bought the in 1997 for $1 plus back taxes that added up to $120,000; he sold it to the first owner you mention above. Thanks for posting the pics (from my Twitter?). Let me link to Kim and Bennett pictures as well, we had a really good time exploring this place together on this perfect day, and we have different shooting styles. I was contacted by a few urban explorers since then for "directions" (Paul, Bob, Michael, Justin, etc. ), and I think they will post what they have once it's ready. I like that they shot the exact same doorway as we did a week earlier. Do you know how many doors there are in this building? :) A lot. We are definitely curious about the history and anecdotes associated to the warehouse. When it was operating at full capacity, it must have been quite the beehive. This site is awesome. It always picks out the exact, specific things I'm curious about... I remember back when this building it had stuff painted on it. (Never remembered what, I was a little kid!) There's gotta be something useful that this building can do other than be demolished. Sure, it's an eyesore, but can't that be fixed? 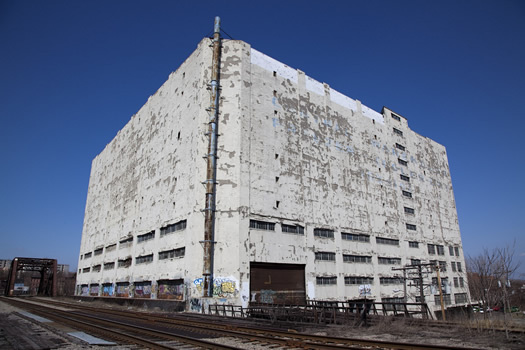 Fortunately or unfortunately, the Central Warehouse will be an eyesore for a while yet. It costs much more to rehab than it would be worth, and costs much more to tear down than the lot would be worth (I believe I remember reading that demolition would cost about $4 million and the lot would only be worth around $1 million). It would take a philanthropist or massive subsidies/grants to make any work on this place financially sensible. Which is sad, because it's one of the first things that people see when they're coming into Albany from 90 or 787. They should knock it down and put in a park. With swing set, a volleyball court and an amphitheater. And then do Shakespeare in the park. When will AOA stop circle jerking every time Sebastien takes a picture? How come every time S takes a photo there is a post about it? When it stops being so gratifying, fuj. Stop being jealous and join in on the action, unf unf unf. At least before the economic slowdown, there were redevelopment plans in the works for the warehouse. Interesting thing is that there's a nearly identical building in Toronto that was turned into condos and retail. "A group calling itself CW Montgomery LLC purchased the building in May for $1.4 million and already has met with city officials to discuss its plans. CW Montgomery is associated with Axiom Capital, a downtown Albany investment firm. Charles Cronin, Axiom's founder, this week declined interview requests. Michael Yevoli, Albany commissioner of planning and development, said the investors are at the "very preliminary" stages of deciding just how to adapt the building. There is, however, a successful redevelopment model for investors to follow: A nearly identical warehouse in Toronto, built a year earlier than Central Warehouse and believed to have been constructed by the same developer. Converted into a mall and residential complex in 1983, the complex, Queen's Quay Terminal, is credited with sparking development in its lakefront neighborhood. Albany officials hope the Central Warehouse could do the same here. Saying the redevelopment of such a prominent building could send a potent symbolic message, they are especially pleased the investors are eyeing the development of something central Albany sorely lacks: retail." @thefuj: I don't do bar mitzvahs or weddings, but I should totally do circle jerking pics, thanks for the tip. Want in? Circle jerking is pretty much what I was always afraid was going on in that warehouse. Instead of hating him for going someplace I wouldn't I was thinking of making a request. Could you do the abandoned Bab-O factory next, Sebastien? @the fuj & anon: I would say it's probably because he is a fantastic photographer and takes amazing photos that give a different perspective on things. His photos are fun, well composed and usually have a great these whether it be an unknown building or a fun game of find the gnome. They also start great discussions in the comments that keep readers/viewers interested and informed. They have obviously posted photos by other photographers as well (ie. Kim) so it's not just him. The offensive comment is completely unnecessary and surely not in the spirit of this blog. I suggest you take your negativity and stick it elsewhere. Comments like that come off as shear jealousy and make you sound like an idiot. I read that article Chris, it was great. But it also seems like the property has changed hands multiple times in the last two decades or so, with each new owner saying they want to look into redevelopment, but shunting it off to the next person once they realize what will go into the project. Here's hoping. @CJ....if the abandoned Bab-O factory is the building I am thinking of, be aware that it is still owned and occasionally used by the company I work for. We moved from that place only last November up to Troy. Not sure it is the same building but I was told while I worked there by a local that it was once the Bab-O factory. We are now in the old Quandt's Brewery Building (most recent commercial use was as a Boardmans) on River St. which has been a fun place to get to know. On the Sebastien photo topic...I love that he is so actively documenting the area and find his photography well worth the space it finds on AOA! A friend of mine who works at the Albany Planning Council presented an idea to some committee to turn this warehouse into an aquarium! I love the idea and think it would be a draw to downtown. @Karen Interesting idea...but the image that passed my mind when I read it was of a big bowl alongside 787 with giant goldfish swimming around in it! Maybe I should stop work and go home! I've been in love with this building for years! I talked to a few people I met while riding my bike around the area back in '07 and heard that the city was looking to reconnect Colonie Street (currently there road is bisected by railroad tracks) and that Israeli investors had been through and were involved in buying the property. Both claims are totally unverified (the study to reconnect Colonie street would be easy to verify) so take with a grain of salt. More importantly, could you imagine living there?? You could walk back home from Wolff's after a couple giant mugs of Optimator! @Bob: I've to say, I don't know the Bab-O factory. Update: CJ explained to me: the hulking beast on Broadway, just south of the U-Haul building and highly visible along 787, is the former Bab-O (B.T. Babbitt) factory. If it's a factory and there is pigeon crap by the metric ton, then yes, I'm sure we will try to explore it. Winter was a bit long, exploration will resume shortly. In the meantime, no booby-trapping the place, thanks. Some of the photos look like the interior of the Titanic without water...creepy! Leave it up, rehab it with the money we get from Albany police officer's drunk driving fines. Tear down 787. Turn the empty space where the highway used to be into the riverfront park it should have been. Build a minor league baseball stadium with the newly done-over warehouse as the backdrop. Build stores and an extended downtown around it, a la Coors Field in Denver and Camden Yards in Baltimore. You're Welcome. @ Save Pine Hills - add in the Schenectady cop's fines and the financial crisis could end. haha, i just got cuffed by apd for checking out the insides of the buildings. thankfully i didn't get arrested, even though nothing would materialize since the owners are awol. I live close to this place, have walked passed it a million times.....and never gotten in, so thanks for the pic, now I can put my curiosity to rest. @Luke...I'm one of the lucky fellows that does live close enough to the Biergarten to walk it home, it makes me love myself for moving to the bottom of Clinton a few years ago. Has anyone spyed any gnomes in the building?.....and whats up with them, I havent heard lately. There is also a real rad church a block away from there (N.Pearl), complete with a sweet rectory....you can barely see either of them now due to all the ivy. Thanks again for the read and pics. @abby hahahaha nice Parks & Recreation quote from last night. well played. "The Federal Highway Beautification Act?!?!?!" Why would a "Year of the Bible sign" draw the state's "wrath?" I should have known the government was somehow responsible for this eyesore. But hey, I suppose a massive vacant building resembling something in the slums of Sarajevo is better than a maintained and functioning building with a sign offending some atheist somewhere. What a disgrace. As andrew said - Don't be stupid, people! Even if the building is not in use, it's still trespassing, and you're taking a risk going onto the property or into the buildings. Not to mention the plethora of other dangers that can lie inside these kinds of buildings. Don't do it if you don't know what you're getting into! I'm not sure why AOA even posted this complete with a location map and everything. It's just going to get people in trouble, draw attention to the building, and get the place sealed up, which totally works against urbexers anyway. I appreciate the link to my photos, but this isn't the way I'd prefer them to be referenced. Surprise, surprise, another vacant building in Albany with MIA owners. It's tempting to demand these guys live in the buildings they purchase for a little while, but maybe I've seen the movie, The Super, one time too many. I'm a little envious of the urban explorers. Great pictures! @CJ and -S I think I know that Bab-O building and no, it is not the same place where I worked until November...is this the building you refer to? This building was on the opposite side of the tracks from where I worked. Before the grade crossing was closed, it would have been the corner of 4th Ave and Broadway. @Bob F. -- I assume all these buildings are owned by somebody, and trespass is trespass, so you don't need to worry about me going in. I have too much respect for the power of decay to want to find out if a floor is intact.And just stopping in that neighborhood with a camera tends to bring unwelcome attention. @JVG -- I would love to be able to shoot even the outside of that beautiful church on N. Pearl, but ditto on the neighborhood conditions. Actually what's really to blame are absentee owners, the place has not been "in use" in years. It has changed hands from one speculating real estate developer to another, and in the meantime the interior crumbles more and more, meaning it costs more and more to rehab it, meaning the cost:profit ratio shrinks further every year. Because it has been left abandoned for so long, it is no longer profitable to either rehab or tear down the structure. The Central Warehouse will be with us in its current incarnation for a long time unless someone with a lot of money to lose intervenes. I remember when they closed the place down but still kept the cooling machinery running. The city was pretty certain the pipes had cracked with age and the only thing preventing a cloud of ammonia gas was a layer of ice. Sure, you could make it into condo's, but would you or anyone you know really want to live there? That part of Albany is ROUGH. Great photos, Sebastien... I love this urban decay stuff. If one would want to get into this "Bab-O" building, I'd suggest, in this order: a crowbar, a bottle jack, thermite, and a great lawyer. Thanks for posting these. The difference between an Eyesore and an icon? Age. The building has been a part of the Albany skyline for over 75 years. With a creative redevelopment scenario, and attention to detail for exterior rennovations, this building could be the crown jewel of albany's few adaptive re-use buildings. I ran into a guy who was entering the fence around the Central Warehouse this morning. I asked him what the story was, and he told me that his company Mobile Metal owns the place and they going to tear it down in "about six weeks." Very sad. It's an eyesore, but for some reason I still love it. Mobile Metal must of filed with the city to demolish the building, maybe I can find out more concrete details tomorrow at City Hall. Back when I had a life I wrote briefly about crowdsourcing a development here in the city (http://www.beauxalbany.com/2009/02/crowdsourcing-new-downtown.html) and although I explicitly mention new construction, I always pictured doing a massive rehab at the Central Warehouse. Something about that building screams potential, and that rail line; oof, big project but it could be amazing! Tearing down the Central Warehouse?, that's big news, it's a huge huge building. Please keep us posted, we will go take photos of the demolition. So, end of November this place is supposed to go down. I'll believe it when I see it; the building has been through several hands in the last two decades with no change, except for the additional deterioration that comes with time. "tear[ing] it down" would almost certainly require a demo, I can't see how it could be dismantled like the Wellington was. The top eight floors have exterior walls two feet thick. I'm not sure how I would feel about losing the Warehouse. There's no hope of it ever being rehabilitated; not only is it just too far gone, it's not the right type of building. There are only four windows on most of the floors, they're portholes more than windows. It's an eyesore, and something better could definitely go in the space, but I think we all know that anything built there would just be a pet project of Jerry's to funnel funds from the city to his friends' pockets. It's almost worth keeping around in its current state as a sort of reminder, of many things. I've always thought someone should set up scaffolding for a week and let the people of Albany decorate the building however we see fit. Rinse and repeat every few years to keep things interesting. Then fund-raise for the cause and remodel the inside floor by floor into an art gallery. It would be good all around; Albany gets the building completely graffiti'd for free by locals, it changes from an eyesore to an art installation, the move is picked up by newspapers across the country, and overnight Albany becomes the forward-thinking artistic center of the world. Or just tear it down... whichever. Demolition?!?!?! A total surprise. It seems to me it would cost more to tear it down and rebuild than simple build on an open site. Really odd - I rally want to hear more. Last news on the building I was aware of was that a NYC-based developer was looking into making a go of redevelopment. @daleyplanit: it's a rumor for now. My secret hope is that they blast it. But not until the "Ghost Hunters" get in. Then *boom*. Ok, I got another rumor update. I ran into more guys coming and going from the warehouse and when I asked one of them about demolition he said that it wasn't in the plans since the building is in "great structural shape." He said they were just cleaning the whole place out. Kinda frustrating getting conflicting stories. I apologize for the unreliable nature of this information, I just walk past the building where I park if I drive to work. I'm still hoping to get to the building department in city hall and see what I can dig up, but I've been kinda busy recently. I can't really see them demo'ing this place. It would be well over $1M to do, not to mention the potential disruption to the very nearby rail lines. And for what? A few acres in an isloated corner of the Industrial North End? One Mil plus for 2K worth of bare land? This the kinda project I wouldn't feel bad sicking BBL on, at least they could pull it off. I have 10-15 "dream propeties" I've been keeping tabs on that I'm dying to see redeveloped. stay away from 222NP, i'm gonna make that my house someday soon ;). This building is currently on fire. Old does not mean historic and interesting and different does not mean it can have a successful future. A ugly hulk of concrete in a location that has zero attraction. The list of buildings in Albany that should be demolished is huge and the best approach would be to make them green space until the areas become attractive. We can allso thank the fools who put 787 next to the river front property. I got to see the Central Warehouse close up on a regular basis because my own family has a warehouse in that area, for at least 60 years or so now. While growing up I actually saw the CW building as a big, mysterious, working mountain of concrete. A dusty, dirty, industrial petroleum- smelling area in which I never quite let my guard down. While in the warehouse district, I new first hand how quickly the seamy streets could turn on someone -especially a kid. My father had a whole flatbed truck vanish one night down there in the row. Even his own personal truck one afternoon. Odd how things could just disappear where you'd be hard pressed to see a human on the street. Kind of Twilight Zoneish and other worldly. Dry ,uninspired, unchanged and unaffected by the goings on of real fleshy people just a few blocks away. So, it is odd to me these boring walls could some how have attached to the emotions of my youth. I had always wondered what was the interior like. What did they do in there? Why don't I ever see anyone coming and going from it? So powerful, secretive and creepy- the Central Warehouse, the neighborhood, and the fire. This building is loaded with asbestos! This was a dangerous fire and this building needs to be sealed and dismantled. Wish I had known more about this building before yesterday. I have some interesting musings for thie forum. Firstly, asbestos in the concrete??? would this asbestos thermally protect the underlying steel girders in the massive concrete columns that support the innards of the building? I am not an engineer, but if the asbestos helps the structure maintain its integrity, then the fire will merely remove all debris, old insulation, paint, etc, right? Second, Central Warehouse has been compared to Worcester Cold Storage, which to me doesn't seem fair. A trap for firemen, yes, for sure. But the structure itself, based on S's photos I've seen, is certainly different from the Worcester structure's wooden upper levels. Central Warehouse obviously appears to be entirely of steel-reinforced concrete on a massive scale. I've read a Homeland Security report on the Worcester tragedy online, and that structure was brick & mortar and mostly massive wood beams and support columns, except for the lower two levels. Third, maybe the most important, is that if the structure retains its integrity after the fire burns itself out, then this might make for an interesting development option. The fire would have done the dirty work, removing debris and leaving ash to be removed. As far as the asbestos in the concrete, that should be able to be encapsulated with epoxy or something, right? Look at Toronto's Queen's Quay Terminal, built a year earlier, by the same developer as Central Warehouse. Upper floors (Cold Storage) could be converted into lofts, while the lower levels could house retaurants, boutiques and other retail stores. This could really improve dowtown Albany and add to the attrction of the area as a whole. @Geek: "the best approach would be to make them green space until the areas become attractive"
Good approaches are not lacking, it's the cost of even demolishing the building that was prohibitive. We shall see now. @JT: "Upper floors (Cold Storage) could be converted into lofts"
Unfortunately, I don't think that's possible. We thought about it the first time we visited the place, but the walls in the cold storage levels are *thick*. Like really, really thick. Carving new windows would be difficult, and the thermal inertia of such lofts would be uncomfortable (I live in a brick house myself). And you are right, there was no wood beam at the CW. Some levels though were full of wood, old paper, very flamable stuff. It's a really gigantic place. Does anyone have any information about who the developer was that originally designed and built the Central Warehouse? I believe it was the same developers that built the warehouse in Toronto that many have drawn parallels too but I can't seem to find anywhere just who they were. Albany needs to start getting in touch with absentee building owners and either make them take care of the buildings they own or give up ownership. Why should those of us who live in the city have to look at these rundown pieces of crap while these people live out of the area. Another thing is that I have never been to an area that is so close to a river/water source but instead built a highway where a vibrant riverfront "SHOULD" be. 787 may have been the worst idea ever but I am sure that some kind of stupid politics and agendas were served by building 787. Mark, I don't like seeing these buildings sitting vacant just to further decay either. But I guess the suggestion is for the city to take ownership? What would it then do? It's really doubtful that any kind of renovation of the Central Warehouse makes financial sense, and that goes for many other sites (Harmony Mills and Victory Mills are shining exceptions). So the city then fronts the bill for demolition? That seems like a raw deal for taxpayers; at least with an owner there are some taxes being paid. I suppose the city could try to auction it off but I see a repetitive cycle happening there. Instead of taking ownership maybe the city could have the authority to sue building owners who don't keep up basic maintenance. Like in many other areas of our society, the only way you'll get these people to do anything is by threatening their bottom line. Totally agreed with you on the riverfront, BTW, I would love to see the stretch of 787 by Broadway turned into a tunnel. With respect to Ben R's question ~ of three-and-a-half years ago! I believe that the Central Warehouse may originally have been built by what was, in 1916, the Albany Terminal Warehouse, Company. My great-grandfather, John F. O'Brien, who was also a New York Secretary of State in the early years of the last century, was its President. He died in 1927, the same year that the first comment on this page, by Steve Barnes, gives for the Warehouse's construction. By 1930, the organization's name had changed slightly, to the Albany Terminal and Security Warehouse Co. My grandfather, John L. O'Brien, Sr, who died in 1980, was its President. This fits with my memory that the Warehouse was the part of his patrimony that my grandfather chose to emphasize. I am preparing for my first trip stopping in Albany ~ very briefly, I'm afraid ~ since the death of my grandmother in the mid-'Eighties. My grandparents' house in Loudonville is now Saint Francis House at Siena College. I believe this warehouse was built possibly by APW of albany. American Perforated Wrapping Paper Ltd. APW owner was the inventer of rolled Toilet paper., as well as making many of the early toilet paper holders. These were very ornate and are collected to this day. Reason i came across this is that APW also had a mill to make the pulp in Sheet Harbour Nova Scotia where I live. Also i have found reference that in June 1925 a ship carrying this pulp from Sheet Harbour went to APW in Albany and was the first ocean going ship to reach Albany. So far have not found the name of the ship but would sure love to know. Yes this building may be a eyesore but there is a lot of history behind it. And does it look the same as it once did? I have no idea. But what it could tell if it could speak. I never knew this building existed until I rode by it on the Amtrak on the way to Utica this am. I was immediately taken by it; haunting, creepy, and intriguing. I'm inspired to write a ghost story based off this gem. I'm sure there's some great stories behind this place.